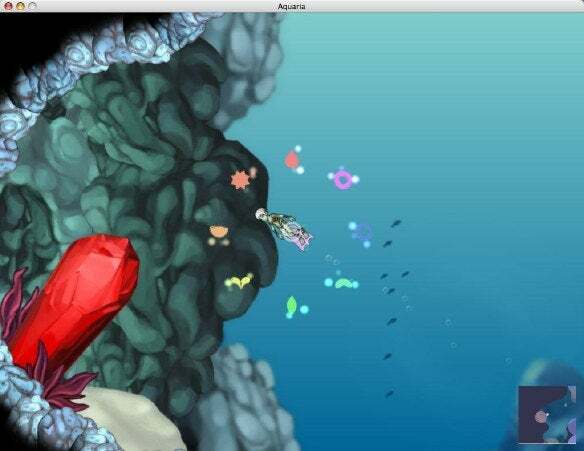 Ambrosia Software on Thursday announced the release of Aquaria for the Mac. A free demo is available; Aquaria costs $30 to register. Aquaria is a 2D side-scrolling game set underwater. You must explore an underwater world, solve puzzles and engage in combat as you control Naija, an undersea dweller who finds herself alone in an ocean teeming with life — some friendly, some unfriendly. You must solve the mystery of Naija’s past while defeating and outwitting the creatures she encounters along the way. Naija has a gift called “The Verse,” the ability to sing combinations of musical notes in ways that enhance her abilities. She can use The Verse to transform herself to be ready for combat, stealth, speed and other special moves. The game features dozens of areas to explore. It also comes with a custom level and animation editor. System requirements call for Mac OS X 10.3.9 or later and a G4/1.42GHz or faster Mac, including Intel.